This article presents concrete examples of Thorvaldsen’s letter-writing process and the number of stages it involved. It was well known that Thorvaldsen was anything but fond of writing letters. As one of his good friends, Herman Schubart, wrote of him: “I know that he would rather model two [sculpture] groups than write a single letter” (cf. the letter dated 30.9.1805). Thorvaldsen’s aversion to taking up the pen is discussed extensively in the Related Article on Thorvaldsen’s Spoken and Written Language, to which the present article is an appendix of sorts. Here the reader will find examples of Thorvaldsen’s letter-writing process, from the first draft to the completed letter, with attention paid to the number of rounds of revision involved. The goal is to provide concrete insight into how much of this process, and how little, Thorvaldsen was involved in himself; the degree to which he was in fact able to write on his own; and the extent to which he was helped by his so-called amanuenses (secretaries to aid with writing). In his first years in Italy, Thorvaldsen evidently managed to take care of a greater portion of his own writing needs than would later become his habit. In Estrup’s biography, for example, Thorvaldsen states that his biannual reports to the Academy of Fine Arts during the period 1797-1804 “always had a fortunate ring: he wrote them himself.” Nevertheless, Thorvaldsen did receive help with the writing process even at an early stage—as is evident in the two examples presented here. Later in his life, meanwhile, Thorvaldsen was more inclined to let his amanuenses write his letters for him in their entirety. Here it should be noted that today—naturally enough—we have direct knowledge only of the written component of Thorvaldsen’s letter-writing process. We simply do not know to what degree Thorvaldsen dictated his letters to amanuenses, planned their content with them, or allowed them to formulate the letters themselves. This article may be extended at some point to include additional examples. 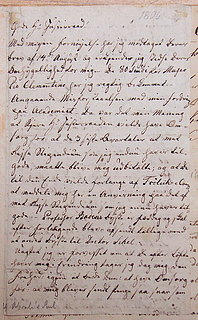 A letter dated 23.9.1806 from Thorvaldsen to Abildgaard is extant in three versions: two drafts and the posted letter. One draft was written by Thorvaldsen himself, while the other was penned by his friend and fellow lodger C. F. Høyer, who often helped Thorvaldsen with letter-writing during the years 1806-1811. The formulations in Thorvaldsen’s draft differ more from the letter as mailed than do those in Høyer’s draft, which are more or less identical to the ultimate result. Thorvaldsen’s draft must therefore have been an earlier draft than Høyer’s. Moreover, given chronological evidence pertinent to the completed letter, it is likely that all three versions of the letter must have been written on September 23, 1806; on this see more in the general commentary to the posted letter. The letter’s three extant versions thus give us an illustrative look at how one of Thorvaldsen’s letters came to be written. One can imagine that the writing process took place in the following way: Thorvaldsen received a letter from Abildgaard dated 14.8.1806—most likely in mid-September 1806 (on this see the Related Article on Mail Processing Time). 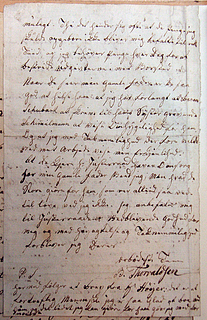 Abildgaard’s letter required an urgent reply, as it reflected a misunderstanding about finances that Thorvaldsen was eager to dispel (see the letter at issue for more details). Thorvaldsen composed the first draft of his reply on the back of another letter that he had just received. He then asked Høyer to revise his draft, and finally copied Høyer’s revised version himself, while nonetheless making certain adjustments to Høyer’s text. Here follows a comparative account of the text of each of the letter’s three versions. Where words are marked in grey, they were ultimately not included in the letter as mailed. Thorvaldsen’s own draft of the letter, written in pencil. Click here to see a larger version of the photograph. 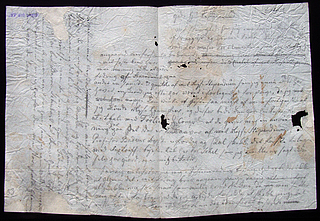 As is evident visually, only a very small minority of the formulations in this draft were preserved in the letter as it was ultimately mailed (the phrases marked in grey were removed, while the black text survived). 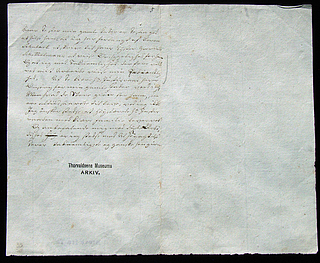 On the other hand, the draft’s thematic content is preserved in the posted letter, apart from a few important details. It is also clear that tales of Thorvaldsen’s inability to write are greatly exaggerated. The sculptor articulates himself well enough, even if his spelling problems and difficulty in tying all of his sentences together are also evident. For more on the latter issues, see the Related Article Thorvaldsen’s Spoken and Written Language. 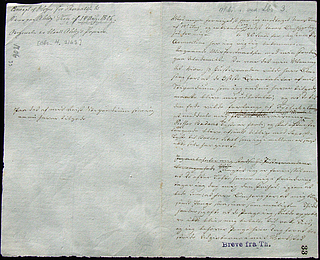 First page of Høyer’s revised version of Thorvaldsen’s draft. 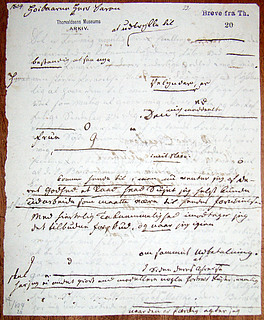 The last page of Høyer’s revised version of Thorvaldsen’s draft. From a present-day perspective, on the other hand, Thorvaldsen’s language does seem more direct and less ornamental. The best example here is the sculptor’s line: great ones readily forget what they promise, which in Høyer’s version becomes: I do not know what the great ones, who are always so ready to make promises, do… In this example, Thorvaldsen’s talent for formulating short sentences in an epigrammatic style is lost to Høyer’s high-flown, diplomatic wordsmithing. At the time, however, Thorvaldsen’s more direct, unschooled approach could well have been regarded as breaching the etiquette and epistolary customs of the day. On this see also the Related Article On Letters and Writing. First page of the posted letter (Manuscript Department, The Royal Library). 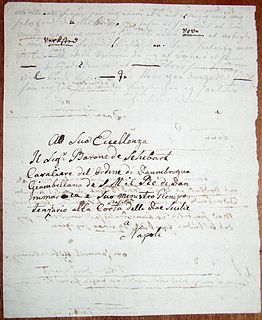 It was with great enjoyment that I received your letter of Aug. 14th, and I acknowledge your solicitude for me as ever—I did duly receive the 80 Scudi for the Museo Pio Clementino.—As for the misunderstanding regarding my demand from the Academy—It was my intention that the dear sir, Councillor of Justice, would take care that the three last quarters of my stipend, which I still have owing to me, be disbursed to me, and that, to this end, you would request that Frölich & co. send a bill of exchange to me here regarding the portion of my travel stipend that I still have owing to me.—Professor Baden’s bust is finished, and will be sent upon request, along with another bust for Dr. Scheel. Although I am certain that you, as promised, have me in remembrance, I do nonetheless take the liberty of asking you once more to take care that I be sent money as soon as possible. For it often happens that the money I should receive is not paid to me at the proper time, and I need money every day in order to defray the expenses in my workshop. When you see my elderly father, please greet him and say that I have asked Baron Schubart to write to his sister, Countess Schimmelmann, asking her to show him solicitude. And that in gratitude for this, I would show you my appreciation with my work. Last page of the posted letter (Manuscript Department, The Royal Library). A similar dampening of polite expressions can also be seen a letter dated 6.8.1804 from Thorvaldsen to Abildgaard, for which Herman Schubart had written a first draft. Here, once again, Schubart’s first draft reflects a more formal epistolary norm than the friendlier tone found in the letter as mailed, and which corresponds more closely to the tone that Thorvaldsen normally used in his letters to Abildgaard. That this letter of September 23, 1806 was produced in three stages is apparently typical of Thorvaldsen’s letter-writing process. His difficulties in composing letters are evident, but they are due in no small part to the fact that—presumably because of his lack of refined schooling—Thorvaldsen often expressed himself more bluntly than was regarded as correct and proper at the time. Thorvaldsen’s letter dated approximately 1.2.1804 to Herman Schubart also represents a quite illustrative example of his letter-writing process. In this case, however, we only have a draft letter written in pencil by Thorvaldsen, while Georg Zoëga must have been the source of numerous strikethroughs, corrections, and additions in ink. These corrections bear the unmistakable mark of Zoëga’s hand, as for example in the latter’s letters dated early February 1802 and 24.10.1797. First page of Thorvaldsen’s pencil draft, with Zoëga’s corrections in pen. The original pencil draft gives a very good indication of how Thorvaldsen wrote on his own devices. In order to emphasize the difference between Zoëga’s corrected version and Thorvaldsen’s original, the pencil draft is first copied below without Zoëga’s corrections. Thorvaldsen’s penciled text is sometimes very difficult to decipher, not only because of Zoëga’s corrections in pen, but also as a result of Thorvaldsen’s own strikethroughs and overwriting in pencil. Despite this, the text is reproduced here as accurately as possible; the words in grey were altered during Zoëga’s revision of the draft, while those in black were spared. Last page of Thorvaldsen’s pencil draft, with Zoëga’s corrections in pen. The Archives contain two drafts of Thorvaldsen’s unknown letter dated 27.10.1804 to Herman Schubart. Of these, one is somewhat more thorough than the other. Although not all elements or stages in the writing process are known in this case, these two extant drafts do provide a very clear picture of the difficulties that Thorvaldsen faced when he needed to write by his own hand.